This car is equipped with a steering with the hydraulic amplifier, which combines in one unit (unit) with self steering. GUR Zil-130 reduces the necessary force which is applied to the steering wheel to turn the front wheels, and also reduces the intensity of the shocks, arising from the irregularities of the road surface (or lack of it as such) and thereby increases the degree of traffic safety, while allowing the implement control vehicle moving direction in an emergency, such as a gap tire front wheels. 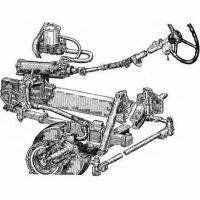 Zil-steering mechanism 130 comprises in its arsenal screw nut mounted on the circulating beads and also rail with toothed sector. The gear ratio is 20: 1. Joins it to the frame and fastened together with GUR column shaft using the propeller shaft.